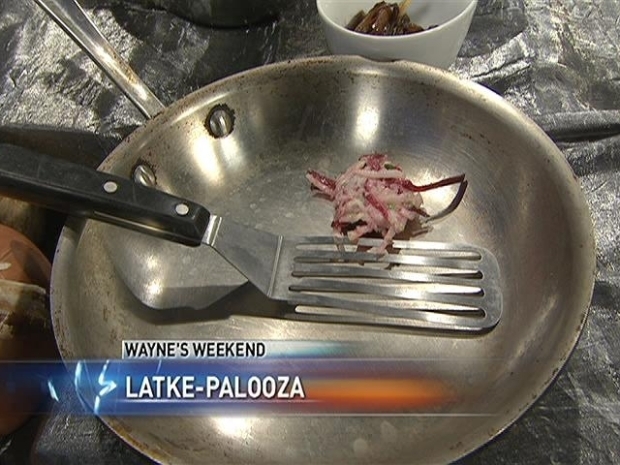 Wayne Johnson creates a Latke dish. There are many rituals associated with the various holidays that we all celebrate. With Hanukkah, latkes have always been a favorite in the Jewish community. Traditional latke recipes abound, but this week I was fortunate to have Chef Laura Frankel, Executive Chef for Spertus Kosher Catering, join me and share new ways of taking the basic latke to a whole new level. She calls her range of recipes Latke-Palooza because she created a different recipe for each night of the Festival of Lights. Whether she’s added carrots, parsnips, celery root, roasted garlic, or fresh herbs, or given applesauce a flavor kick, Chef Laura has created quite a flavorful variety. The real treat for everyone is that whether or not you are celebrating Hanukkah, these little potato delicacies can be a flavorful delight on everyone’s table. I like really crispy latkes that are only slightly creamy inside. I don’t use yolks in my batter as egg yolks make doughs and batters tender. Egg whites hold the ingredients together but don’t make it soft or cakey. Place the shredded potatoes in a large clean towel and squeeze out all of the moisture; make sure the potatoes are completely dry. Place all of the remaining ingredients in a large bowl and add the potatoes. Mix all of the ingredients together until thoroughly combined. Heat a large skillet with 1-½ inches of oil. Drop spoonfuls of latke batter into the oil. Flatten it slightly with the back of a spoon. Brown the latkes on both sides. Remove to a platter lined with paper towels. 1. Place all of the ingredients in a medium saucepan. Cook uncovered over medium heat until the cranberries pop. Continue cooking until the excess moisture evaporates. Remove the cinnamon stick and stir to combine. The applesauce may be stored and covered in the refrigerator for up to one week or frozen for up to 2 months. ¼ additional flour to basic latke recipe. Chef Laura Frankel is Executive Chef for Spertus Kosher Catering. Founder of the adventurous, gourmet kosher Shallots restaurants in Chicago and New York and author of Jewish Cooking for All Seasons, and Jewish Slow Cooker Recipes she has made it her creative mission to re-imagine and revitalize the diverse—and delicious—traditions of Jewish cooking. Thanks again to Chef Laura for sharing these recipes. If you have any questions or comments, please send me an email at wayne@waynesweekend.com or follow me on facebook.